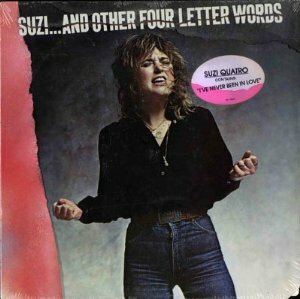 Though Suzi Quatro has sold an impressive 30 million records worldwide, the recent “Stumblin’ In” constituted her first significant assault on the American charts. To judge by this album, however, the U.S. market may soon be hers for the taking. True, Quatro still often projects affected sexuality and a penchant for Alice Cooper-styled inanities. But she has broadened her repertoire to embrace some atypically accessible, pop-oriented melodies; and Mike Chapman’s polished production sounds tailor-made for hitdom. I do continue to view Quatro as a borderline talent. But with the exception of a few out-and-out clunkers, the present set proves at least as bright and enjoyable as it is fluffy and forgettable.